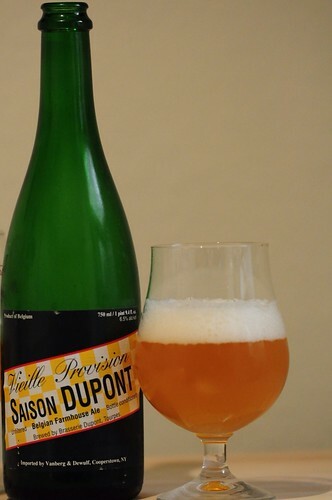 Saison DuPont, originally uploaded by adambarhan. Appearance – Delicate pour yields a hazy golden body with highly active carbonation. Wonderfull fluffy eggshell white head that leaves chunky lacy all over the glass. Smell – Lemon rind, a hint of pepper, light clove, sweet malts, grassy hops, and light aromas of musty cellar and earth. Really balanced and hard to pick apart. Taste – A nice backbone of malt sweetness sweetps across the tongue bringing with it pepper and clovey spice. Subtle hints if citrus fruit sit calmly underneath. The finish is both herbal and grassy with a moderate bitterness. Dry finish. Mouthfeel – Light, fluffy, and unbelievably smooth. Effervescent to say the least. Paired with homemade Cast Iron Pizza, a delicious pair complement each other nicely. The cheese and spice of the pizza is easily cut by the carbonation of this beer. Grab one and give it a try.